A visitor to our forums wanted a macro that could read the subject and sender on incoming mail. It's an intriguing idea and reading the subject is a lot better than a generic "You've got mail!". But what I really need is my appointment reminders read, especially since Outlook's reminder window no longer takes focus. I can't begin to count the number of appointments I missed because I didn't see the reminder! The .Speak method uses the syntax .Speak(Text, SpeakAsync, SpeakXML, Purge), with SpeakAsync parameter defaulting to False. This controls whether the speech is asynchronous. You'll want this set on true to eliminate any delays or hangs in Outlook as the test is being spoken. So in Outlook, you'll use xlApp.Speech.speak text, True to prevent hangs. 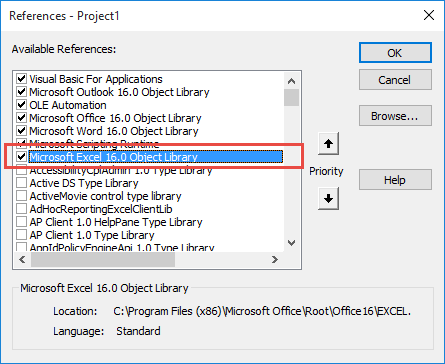 To use these macros, you will need to set a reference to your version of Excel in the VBA Editor's Tools, References dialog. You'll also need to set Macro security to low in File, Options, Trust Center, Macro Settings. This macro is triggered when an appointment reminder fires. It reads the subject, tells you how soon the appointment begins and the start time. This macro is added to ThisOutlookSession. strTimeOffset = timeOffset & " minutes, "
strTimeOffset = timeOffset & " hours, "
The original question was "how to read the subject and sender on incoming message". This code sample is used in a run a script rule. Paste this macro into a module. Create a rule and select the script as the only action. In my example, it speaks the sender and subject of all new messages but you can use conditions to control which messages it speaks. See Run a Script Rules for more information (and other code samples). By default, the voice is male. If you want to use the female voice, you'll need to change the Text to Speech settings in Windows. Note to Windows 10 users: use the Control Panel Text to Speech settings, not the Speech settings in the new Settings area. Thank you Diane. I did Control Panel and changed male voice to female. I had changed this in Settings. I use Insider Hub and get Fast Track updates. I find it odd that Settings is not the default but the old Control Panel dialogue box is. Yeah, it's dumb and I'm not exactly sure why it is that way. I don't know what is going to happen when they remove the control panel from a future version of Windows. Works 2010 but won't work O365 Outlook 2016. References set and security low. Resolved. Win10 new build and now I don't have Cortana Australia - did last build. Seriously it is hard to keep up. My chosen voice is Female but it speaks with Male voice. Obviously this build is a little whacky for Australia! Interesting. I have the RTM build of win10 on this machine... my guess is maybe file corruption if you kept the programs. That has been a off-and-on problem with Win10. Go to Control Panel\All Control Panel Items\Speech Recognition and select Text to Speech to change the voice. Male is default and different settings from the one in the new Settings dialog. I am able to run the "ReadSubject" routine. However, I am having trouble with the reminders portion after upgrading to Outlook 2016. I only get the default reminder chime and no speech. The script doesn't break anywhere either. I do have macros enabled with "low security". Did anyone else have this problem with Outlook 2016? It worked great in Outlook 2010! Please disregard my last comment ("application reminders not announced with speechbut email subjects get read"). The moral of the story is... Reading the instructions is very important ;) What I had failed to do on migrating my macros was to add the "Application_Reminder" routine to the ThisOutlookSession object in the visual basic browser. I had imported everything into a module. Works in Outlook 2007 too! Thanks for the great tool. Yeah, it'll work in any version that includes speech to text in the Excel object model.